I whole-heartedly agree with this comment! I know that sometimes it can feel daunting and overwhelming to pick the fabrics that are just right. And it can be especially difficult when you are trying to be conscientious in what you are selecting to make or gift for someone. Today, I want to remind you to trust your wise inner voice. Can you envision that if you love the fabrics, you will love the quilt? 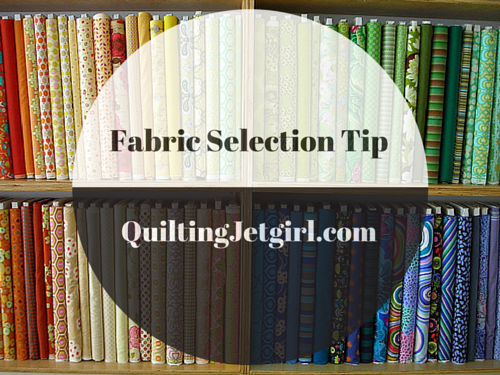 Linking up to Tips and Tutorials Tuesday @Late Night Quilter. And don’t forget to visit the 2015 New Quilt Bloggers Blog Hop Week 1 Post to visit 4 Quantum Quilters and enter for a chance to win one of the (5) awesome giveaways from our generous sponsors. I completely agree! I have made a quilt or two for others in which the fabric was just not my thing. Finishing them was a real struggle! Every step in the process just seemed so arduous! This is so true! My only problem is sometimes I love a fabric, buy it, and then never use it because it doesn’t go with anything else…those fabrics are good for bags I guess. So true! I love the whole process and the finished product when I use fabrics I totally love. I find that true most of the time. I have made a couple quilts in which I didn’t like some of the fabrics, but when the quilt was all done, those fabrics worked and I loved the quilt. Example: my Falling Leaves. The border fabric is not my favorite, but it really works. And I love that quilt! I really enjoyed this. It’s definitely tough to choose fabrics for someone else though. It’s a on earful when you can both agree on something, but it doesn’t always turn out that way. Definitely a good thing to remember, but I do love it when I see a quilt that’s even greater when sewn together than its component fabric parts, and that doesn’t always happen, even with fabrics you love, But I guess that’s one of the reasons quilting is interesting and challenging. I whole heartedly agree with this statement. I have tried to make some super scrappy quilts with some “ugly” to me fabrics and I never like them as much as when I use fabrics I love together. Love this and totally agree! Jen Kingwell said the same thing in a YouTube video I watched today! !